Paula is from San Angelo, Texas. She made a single and went to all of the local radio stations to ask them to play it. A few did. Paula said she recorded in English and in Spanish. “The Voice would be a rebirth” for her singing career she said. Blake said he has family in San Angelo, West Texas. Adam told her not to believe Blake. “I see your ability to attack. I don’t think you’re afraid to try anything. I see a victory in your future and it’s only in this lane,” Blake told Paula. Jake said he was always in sports in high school. He always got stage-fright so no one ever knew he could sing. He put a video up on YouTube in 2010 that landed him a manager in New York. He called it quits and currently works as a bartender. 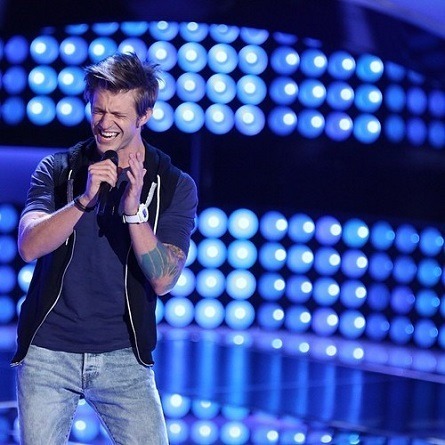 “The Voice” blind audition will be his first live performance. Adam said if that’s how good he is on his first performance, than he can achieve even higher. “Man, I should coach you because I know what you need to do. Let’s do it,” said Adam. Jake picked Team Usher. Shakira and Adam joked that “it must be the shoes” referring to Usher’s gold-toned sneakers. Luke got into music at age nineteen. He joined a local band and started taking drugs. When he found out he was going to be a Dad, he got clean. He left his band when his son was six months old. He now has full custody of his son and works as a nurse in a psychiatric ward. He said he will always be a musician. “This is my last hooray with music and I hope it works,” said Luke. Usher said, “Great performance. You came out with a great attitude. When you hit those big notes, I was like, I don’t know should I do this” (referring to hitting his button). Usher said he felt regretful he didn’t hit his button because Luke had a unique sound, but he only has one slot left. Shakira Brings Out Her She-Wolf! Shakira beat Blake to the button within seconds. “I think you started singing better when you decided that it wasn’t going to happen” Blake said. He said she really opened her voice up then. He then said, “There’s no reason to go on and on about the fact that I’ve won this show a bunch of times,” in his quest to sway her to be on his team. Usher and Adam played commentators to Shakira and Blake’s battle over gaining Ria for their teams. Cierra is 23 years old from Alaska. She got into music by singing in the choir. She works for her dad as an Administrate Assistant. They help relocate families in the military to Alaska. She said Alaska doesn’t have any opportunities for singers. “This opportunity is bigger than anything I’ve ever done,” said Cierra. No Way He’s Not A She! 24 year old Tyler is another singer with a raspy sound. He says he has a raspy, high-toned voice. His mother got him into music and would dress him up like Elvis – in cape. He saw his father’s body burned after he was a victim to a house fire. Tyler got really depressed and just wrote music and played guitar in his room. He said he’d like to give his fiance security and settle down. Tyler currently works as an auto mechanic. “This show is the perfect platform The passion I got for music was through my father. This moment really could be a defining moment and really to give it all a reason,” said Tyler. Adam said, “At the end of the day you have to have a stellar performance to pull it off (singing Stevie Wonder).” He told him to come back and do it again because it could work out for him. From Tulsa, Oklahoma, Alaska and Madi met in a singing group called “American Kids” In 2011 they won the National American Competition. Blake was a former winner himself. They showed a photo of him after he won and he wore a mullet. They said if a ‘Voice chair doesn’t turn, they will go their separate ways. Adam said “WHY do you have to be from there (Oklahoma)!”, followed by, “I know I’m screwed here. But part of the show is knowing that you can overcome- so that’s what I’m going to do here.” He pointed out that he liked them before “cowboy” (Blake) because he pushed his button first. Blake fought back with “It’s a completely different thing when something’s meant to be.” Then he compared them to ‘Pistol Annie’ which they loved very much and were greatly flattered. “I don’t think I’ve met anyone else who was from Oklahoma Kids since I was back there,” Blake said. They two girls still chose Team Blake. Ddendyl is 25 and lives in D.C. She said the cows outnumber the population by 10,000. Her dad plays rare instruments like the bag pipes. She started singing at age five when her Dad would test her on how many notes she could hit, and started training at age eight. 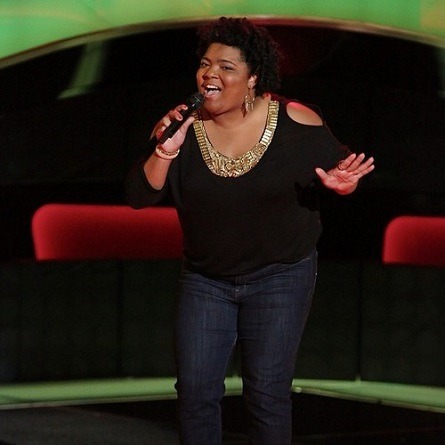 Ddendyl is a lounge singer in D.C. for five days a week. She said he only sings for few people at a time as a lounge singer. “It would be so amazing to work with any of those coaches and make my real dreams come true,” said Ddendyl. Josh is 38 years old. He’s a father and a husband. He is a working musician. He went to get a degree in Philosophy to teach at the local college but ended-up giving lesson on the SAT’s. He chose to sing “One More Try” he said because it’s for his one more try. “Where I’m at in my life I need to have this happen right now,” Josh said. “I’d love to have an artist like you where your voice is so mature. I think you are the real deal. I hope you pick me as your coach because you are the artist I’ve been waiting for,” Shakira told Josh. 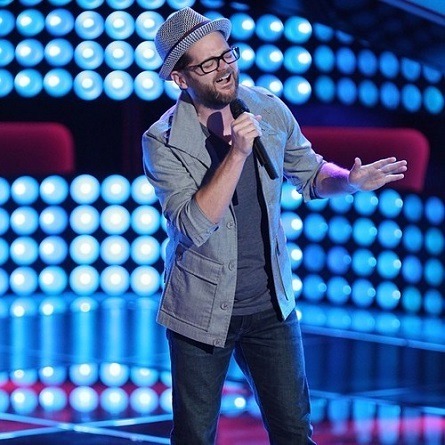 Watch THE VOICE season 6 episode 5 “The Blind Auditions, Part 5” first aired by NBC on Monday, March 10, 2014. This full episode is now available at HOLLYWOOD JUNKET until 09/21/14 courtesy of NBC. ENJOY!